A frittata is an Italian omelette: thick, unfolded and cooked on one side on the hob, then, to make sure the whole's cooked through, placed under the grill for a few minutes. It tastes best cold. Not fridge-cold, just completely cool. Fresh peas would be best, or at least more authentically summery, but I'd be lying if I didn't confess that I make this myself with frozen. Bring the potatoes to the boil in salted water. Boil briskly for 5 minutes, then drain. Put the peas in a bowl, pour over boiling water and leave until you're ready to add them to the frittata. If you're using fresh peas, cook them with the potatoes. Preheat the grill. Heat the oil in a 25cm, non-stick, ovenproof frying pan and fry the onion until it begins to soften. Add the potatoes and cook for about 10 minutes - don't let the mixture brown too much. You want it sweet and soft, with nothing crisp about it. Add the drained peas for the last couple of minutes cooking. Transfer the mixture to a large bowl to cool slightly. Break the eggs into the bowl and beat in. Season and add the Parmesan. Put your frying pan back on the heat; it should still be nice and oily. Pour the egg mixture into the pan and cook over a medium heat for 8 minutes, or until the frittata is set, save for a still-gooey top (remember the frittata will continue cooking as it cools). Take the pan off the hob and put it under the grill till the top of the frittata is golden, just set and beginning to puff. 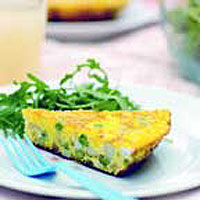 Ease around the edges with a knife to loosen the frittata but don't dig at it too much or it won't keep its smooth shape. Place a large flat plate on top of the pan, then up-end, so the plate's underneath and the pan's on top. Remove the pan and you've got a beautiful, golden-flecked omelette. Leave to cool, then slice.